When you belong to the fashion world, one of the most exciting as well as exasperating things is the arrival of a new collection. You can't wait to see and try it all out. After parading around in some of the finest pieces, you have to heartbreakingly pick just one. The choice becomes even more difficult when the object of desire is a bag. Anyone who knows me, knows, I have a things for bag. The bigger the better! Not that I don't love my clutches and minaudiere, I just have a weakness for bigger bags. A few days back I had a chance to go through Lavie's Spring-Summer 2013 collection. As much as I wish to add a few of those piece to my bag collection; unlike Kareena Kapoor in the ad, I just cannot buy them all! I strongly believe, when you can't buy it all you do the second best thing- create a look. I have created three uniquely different look featuring bags from Lavie's Spring-Summer 2013 collection. 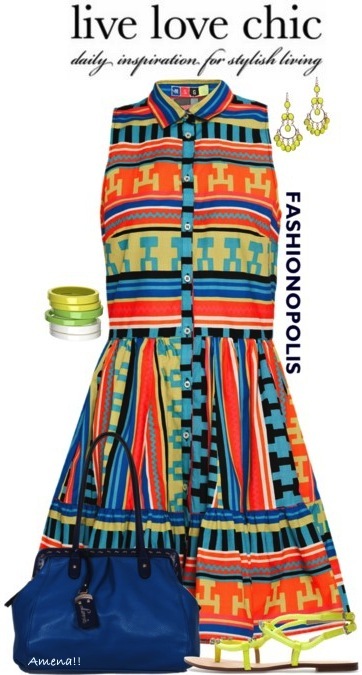 The blue Lavie satchel and neon sandals and accessories perfectly complements this colourful tribal print dress. I am obsessed with the neon and monochrome combo, add stripes to that list and you have the hottest 3 trends of Spring-Summer2013 in one look. The black Lavie tote fits in perfectly well with this eye catching look. 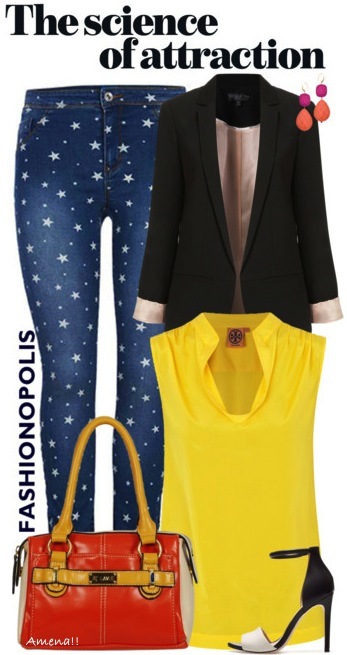 Pair the bright as a sun Lavie box bag with cool star print jeans and yellow top to create a classic A.M to P.M look. Like me if you too have a things for big bags then you must check out Lavie's Spring-Summer 2013 collection. Great styling and collages like always Amena!I so agree with you about 'creating a look' when you cant have all the objects of your desire! Can I say I am in love with the first look!! Want that dress and those sandals..
Great post! Glad I came across your blog. Nice post. For lavie handbags go for Bagzone. I really love reading and following your post. Those bags are sooooo cute!! !